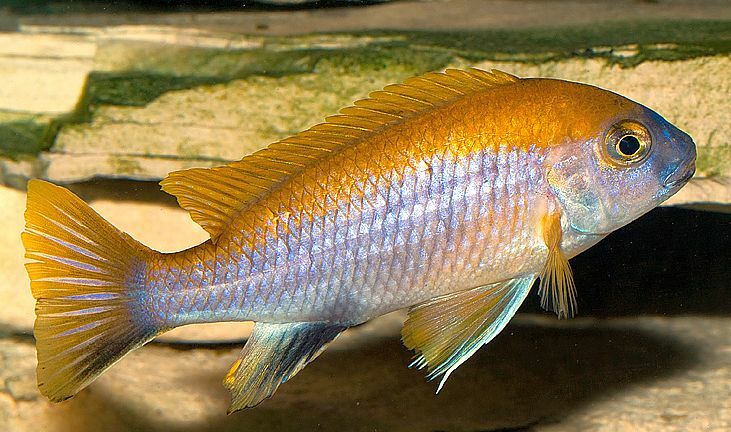 Tag Archive | "Gephyrochromis moorii"
The Orange Top Moori (Gephyrochromis moorii) is a Lake Malawi species that is found near Msuli Point, predominantly at Senga Bay, in the southern end of the lake. Orange Top Moori are also referred to by tropical fish keeping enthusiasts as Yellow Tail Acei, White Tail Acei, and G. Moori. They are a close relative to the White Tail Acei (Pseudotropheus acei “ngara”) where people at Ngara have seen thousands of individuals swimming together. In the wild, Orange Top Moorii have only been seen over open sandy bottoms where most Mbuna cichlids normally do not reside. They prefer living in depths of 20-83 feet in small groups of 3 to 7 individuals where one fully colored male becomes the dominant male of the group. Juveniles live just outside of the rocky areas over sandy bottom. 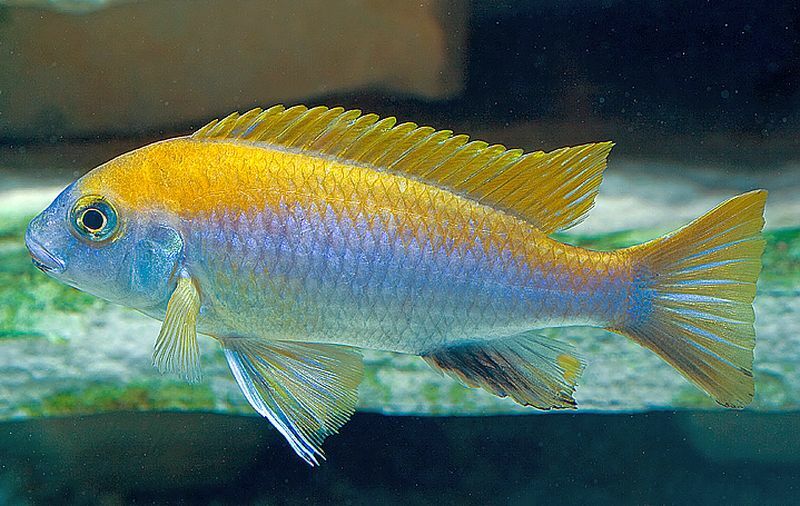 Male Gephyrochromis moorii are colored light blue to silver white at the bottom of the body and a golden brown to a bright orange at the upper part of the body. Females are predominately brown with a yellow tinge and a yellow belly. Male Orange Top Moori are always larger than females of the species. 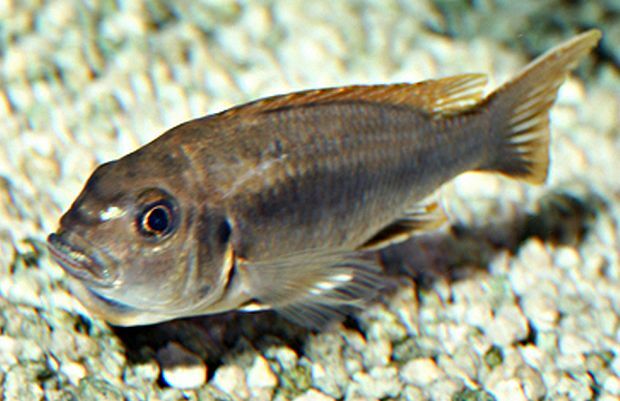 Gephyrochromis moori have strong flat teeth that they use to chew food loose from the sandy bottom or from rocks. They seem to enjoy rummaging around in the substrate, so sand or fine gravel in an aquarium environment is a must. In an aquarium environment, Orange Top Moorii should be housed in at least a 70 gallon tank with a fine gravel or sandy bottom substrate littered with a few small stones. As long as the water hardness can be maintained, the addition of some driftwood can be a plus to mimic their natural environment. multiple males and multiple females and with other calmer cichlid species. Always house more females than males to prevent fin nipping. When breeding, Gephyrochromis moori set up temporary territories where they will keep other males from entering. After breeding, they do not maintain their territories. Breeding activity consists of the female laying her eggs which are almost immediately fertilized by the male. The female then gathers the eggs up into her mouth where they remain until hatched. After hatching, the young are expelled from the mouth of the female but will quickly return in the event of danger. Orange Top Moori are omnivorous but prefer lots of vegetation in their diet. Java fern, hygrophila and anubias will be eagerly grazed on if planted in the tank but high quality flake foods, spirulina, cichlid sticks, algae wafers and an occasional treat of live or frozen brine shrimp are all readily accepted. 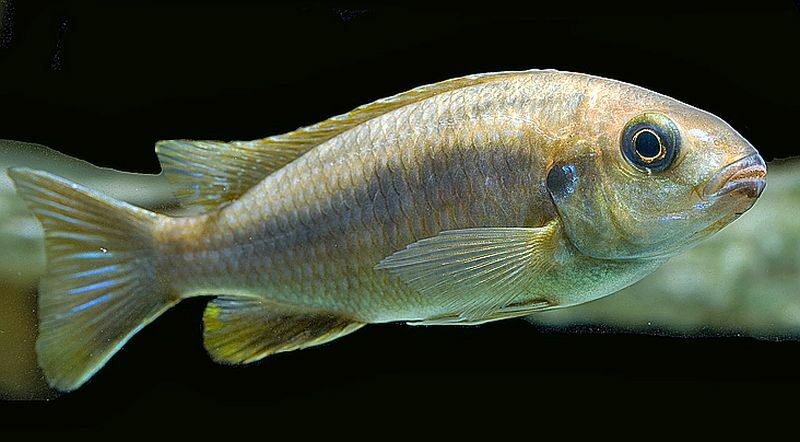 Gephyrochromis moori are not common in most tropical fish shops and are usually mixed in with other juveniles and sold as a “mixed cichlid”. When they are available to tropical fish keeping enthusiasts, they are usually sold unsexed from 1 1/2″ to 2″ in size.